A call for a “science of philanthropy” has been published yesterday on Nature by the founder of Giving Evidence, Caroline Fiennes. Once again, the need of sharing information and publish data about philanthropic giving models and solutions, failures and successes is coming out loudly from experts and practitioners and not only from researchers. How many grants achieve their goals? What proportion of funds are devoted to activities such as preparing proposals or reports for the donor? How satisfied are the recipients with the donor’s process? Well, the first question opens the Pandora’s box of impact evaluation, well known to be a hot topic for grant-making foundations, especially in countries, such as Italy, where an impact culture is far from being accepted both from donors and recipients. Nonetheless, recent legislation in Italy is embracing the debate raised in the last years from practitioners and researchers trying to embed impact evaluation in the philanthropic practice. But the problem still remains: who is going to fund impact evaluations, when they become a rule and not an exception anymore? According to Fiennes, foundations should do it, “although that might initially reduce the resources for the work being funded, it stands to improve the effectiveness of that work overall”. Well, again, not all foundations can afford such an economic effort, nor – above all – have the necessary internal skills and competences to run such type of evaluations (for an Italian audience, you could be interested in this opinion, published 2 years ago). The second question guides us to the delicate issue of the relationship between foundations and grant recipients. The question suggests (at least to me) that a “good” practice would mean dedicating more funds to projects and less funds to paperwork such as reporting and preparing proposals. A question to be answered is how the amount of paperwork is going to raise, if impact and performance evaluation are now entering violently into the philanthropic debate? We probably have to accept a compromise here – more research and study will directly imply a higher paperwork burden for grant recipients, well more than for donors. The third question is my favourite one, the recipients’ voice. In almost seven years of working on foundations and meeting with foundations from all over Europe (and the world) I rarely heard about questionnaires dedicated to grant recipients for this scope (some exceptions apply, see for example the Grantees Perception Report of the Bill & Melinda Gates Foundation or the Rockefeller Foundation, both delivered with the support of the Center for Effective Philanthropy). Surveys and questionnaires are the method mostly used from donors for data collection, of course: for monitoring ongoing or past grants, for getting the recipients’ opinion on results achieved and challenges yet to come. Nonetheless, surveys rarely or never address the relationship between the grant recipient and the foundation, the effectiveness of the foundation’s way of funding or suggested proposals for the future. On this respect, stay tuned for our next research!! We have just been awarded the Italian Research on Philanthropy Awards (IRPAs) for 2017 and we will contribute to fill the gap between Italian foundations funding social innovation and their grant recipients, addressing the recipients’ understanding and appreciation of foundations’ role in supporting social innovation practices. 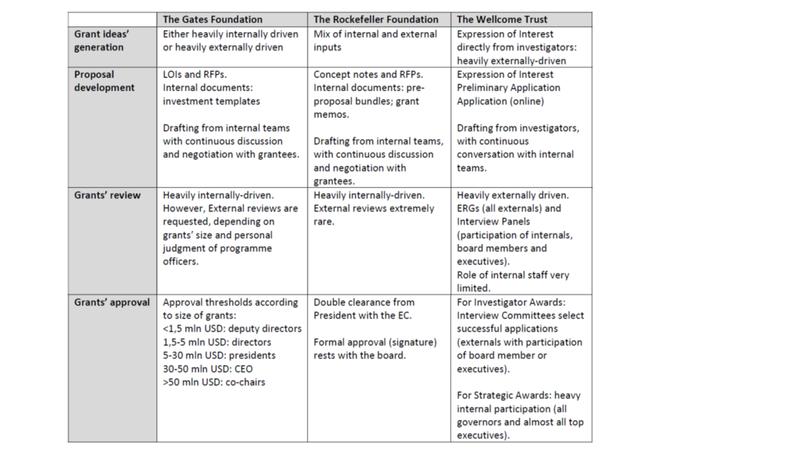 All of these steps can be either internally or externally driven, can see a higher or lower contribution of internal skills rather than external advisors, can involve a massive or soft engagement of the board, can give leaders less or more power and can leave a bigger or smaller space to the potential grantees. An example drawn from the study of three of the major donors for global health is reported here below. Is there a link between the degree of discretional decision of foundations’ leaders and the innovation of the grants funded? Is there a relationship between the power of leaders and the efficiency of the grant-making process? And between the extent of foundations’ network and the effectiveness of the grant-making process? (if you are interested in getting the answers to these questions for the Bill & Melinda Gates Foundation, the Rockefeller Foundation and the Wellcome Trust please go here and enjoy the grant-making chapter). Can Italian foundations learn from this? Of course they can. They can take advantage of the study of their grant-making processes and the relationship with their grant recipients as a priceless opportunity for organizational learning. Probably most foundations already do this, in a rather informal and unstructured way. The further step is to share information connecting with researchers and other peers and supporting their officers’ training and specialization.